The Run Where I Got My Mojo Back! The whole time I was taking a break from running to deal with my hip bursitis I worried about how much running fitness I was losing. The first couple of runs after my break I was really worried about how much running fitness I had lost because even my old super easy pace felt hard. Last night I finally started getting my mojo back! I know some of you can WALK 13 min/miles … I don’t know how! When was the last time I saw a mile in the 11s? Maybe two months ago? Man it felt so good to finish up that mile and see 1-1 click off (even if it was just barely an 11). 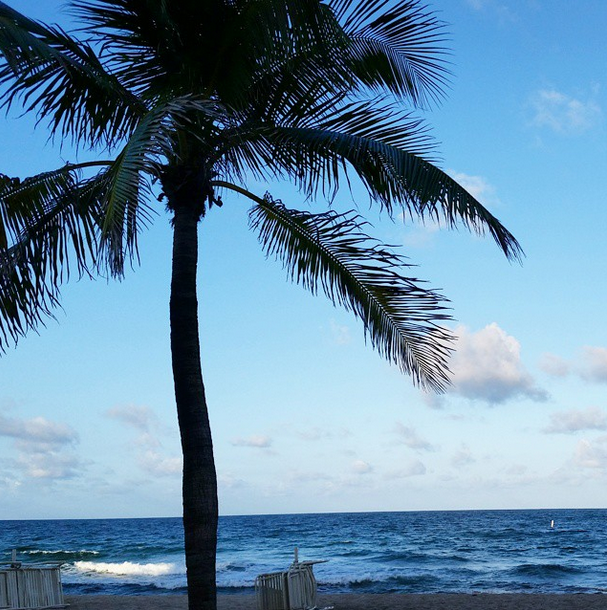 Oh, Fort Lauderdale, I love you! Post run, just chillin! Super grateful that I got to go home from work a little early today and actually got to see the sun from somewhere other than my office! I can already tell that today is going to be an awesome Friday too. Know why? Because Adam has been in Finland and Germany for work the past two weeks and he finally gets home tonight!!!!!!! I can’t wait to pick him up at the airport!!! I hope you have a great Friday too! Any fun weekend plans? Maybe a long run or a race?! Previous Post My Hips Don’t Lie! That is SO awesome! I am really glad you are back and your times are showing you did not lose any fitness. Exactly how long of a break did you have to take for your hips? Did you do any cross training or just have complete rest? Whenever I have an injury, I never know if it’s best to cross train or to totally let the body rest and repair. Curious to hear your thoughts!! Have a wonderful day!! Thanks Susan! Hmm well, the first thing to know about me is that I exaggerate a lot, haha. So, when I say I took a break from running I’m not sure if that’s entirely true. I ran less than 30 miles the last 1.5 months in total which felt like a break from running because I often took 3-4 days in a row off, and I took 7 days off in a row once. 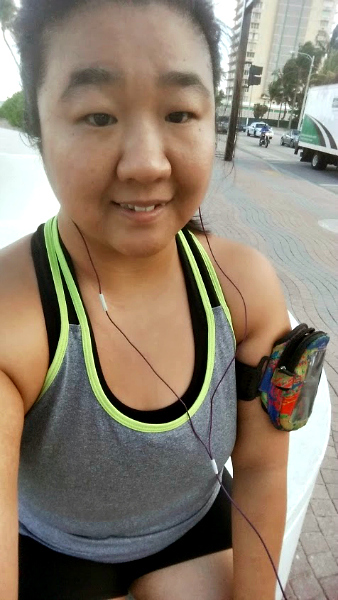 I did cross train while I wasn’t running – but just upper body/core strength training and stretching. Whenever my hip would get tight or hurt I wouldn’t want to mess with cardio or do lower body lifts for fear of making things worse. When I was taking just 3 to 4 days off and then I would try running again I would feel okay, but I would still get these twinges in my hip. That’s when I finally said, “okay, I’m taking seven days of complete rest from EVERYTHING,” and after that is when I finally felt 100% better! That is good info! I often bike, swim and weights during my running breaks because they don’t aggravate the injury but then sometimes I wonder if taking total rest (except maybe upper body weights) would heal the injury faster?! I guess there are as many opinions about that as there are runners, huh? Either way, excellent news on your comeback. I look forward to following your training for your race!! Oh, and I didn’t do any speedwork the last 1.5 months – the few times I did go running it was all just easy run/walk intervals by feel not by pace. The fact that you picked UP the speed at the end and hit the 11’s….you da bomb. I’m trying a new cross-fit / running / weights kind of thing in the morning. Aka looking like a flailing flamingo, but hey, girls gotta cross train :). Have an amazing weekend!!!!! Welcome home, Adam! Welcome home, Adam! Have a fun weekend! I have a half marathon on Sunday! Good job on your run–and hitting your pace on the last mile takes the cake! I hope your half marathon went the way you wanted it to! Looking forward to the recap next week!! Yay! I hope you have a great weekend – I bet Adam has a ton of stories from traveling in Northern Europe 🙂 Great job on a solid run, too! I’m recovering from the world’s worst cold, and I’m practically chomping at the bit to get back to running. Oh no, I hope that you’re starting to feel better now. I bet all the traveling and moving, etc. put a lot of stress on your immune system. Adam only got one day to explore Berlin but he made the most of that day and took a lot of great pictures. He even got to see part of the wall. Unfortunately, the rest of the trip he was stuck on the ship and didn’t get to see anything. Yeaaaaah running mojo!!! So glad it’s back! I think you’re also acclimating to the heat, so on top of your healed hip your runs are going to be so strong now. I love a run that totally boosts my confidence!! Ohh you’re right, maybe I am getting acclimated to the heat. I hope that is the case! Yea! Way to get your running groove and your guy back! I hope you guys have tons of fun catching up this weekend. I’m going camping, so probably no running, but I’m really looking forward to it. I hope you had a great time camping! You pics on Insta made me jealous! It’s been so long since I’ve been camping but Adam and I love it! LOVE the look of that elevation…. my favorite 🙂 Glad you are getting back into the swing of things!! And I bet Adam is going to be even more excited to see YOU! Yay for a strong run! And double yay for Adam coming back!!!! I miss Paul when he’s gone for a day. He must have a cool job since he gets to go so many places. This was the longest we’ve ever been apart! It was SO HARD! Thank goodness for technology and being able to talk/chat/text every day. The time difference thing is hard though because he was at work partially while I was sleeping, and I was at work just as he was trying to wrap up his work day and get dinner/go to the gym/etc so coordinating wasn’t always easy. We both had to get up at around 5am our times to get in our chats some days. Whooo! I can’t wait to hear how it went!! I hope you had fun! I’m running the Blue Nose 1/2 marathon on Sunday and am freaked! I don’t know where my fitness is between tapering for Boston and totally destroying my legs during Boston, lol. Congrats! It always feels so good to get back to your normal self after an injury. I’m always amazed at how quickly it comes back (and how much anxiety I waste on thinking that it wont). I have a long run planned this weekend and I’m pretty excited about it. I’m going to run along a trail that I’ve never been on. It’s always exciting to be in a new place! Ohhh that is great! I have dreams about trail running – trails look so beautiful and peaceful. Plus, i bet the sound of leaves crunching underfoot is really relaxing. I wish we had real trails here!! I haven’t decided what I am going to do about my longer runs yet. Right now since I’m building back my long run after quite a long break from long runs, I’m just seeing how far I can go without them. For Chicago I also really like the idea of running from station to station and just walking through them to get the water down. I think you can do five miles tomorrow if you wanted to! I did six miles last weekend and it went great – I plan to do seven today without any walking breaks. I would just start out extra slow so that you know you’ll be able to carry through to the end. I did my six miler last week as a progression run where I started slower than my usual slow pace and then ended with the last two miles at my usual long run pace. That gave me the confidence I needed to know I would make it without walking breaks, and at the end I still had a little more to give which means I could have picked up the pace earlier on and still made it … which means today I’ll try all seven at my normal long run pace! I’m still super jealous of you, I wish I lived in FL too! Hahahah hope you had fun in Swedan this weekend! We’ve had a couple of rainy days here too – but the rain never lasts long. It will rain for maybe 15 minutes and then go away and leave everything a steamy hot mess! Ugh. Nice! 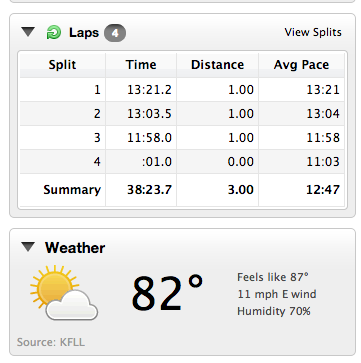 Negative splits to boot! So awesome when things click like that. Yay for finding your mojo! Enjoy the return to running. Love the mojo coming back! I have worried about losing the fitness as well. It’s hard not to! Love that pretty blue water. That’s awesome progress, muscle memory is a real thing! Glad your mojo is back, Stella!